MOOCs provide education for millions of people worldwide. Though it is not clear whether everyone can learn in a MOOC. Building on the typology of MOOC participants introduced is in Chap. 3, and we explore the claim that MOOCs are for everyone. We trace the different reasons people participate in MOOCs and the ways they learn. MOOCs tend to be designed for people who are already able to learn as active, autonomous learners. Those with low confidence may be inactive. However, even learners who are confident and able to regulate their learning experience difficulties if they don’t comply with the expectations of the course designers or their peers. For example, if a learner chooses to learn by observing others, rather than contributing, this behaviour can be perceived negatively by tutors and by peers. This indicates that MOOCs sustain the traditional hierarchy between the educators (those that create MOOCs and technology systems) and the learners (those who use these courses and systems). Although this hierarchy is not always visible, since it is embedded within the algorithms and analytics that power MOOC tools and platforms. The authors wish to thank Vicky Murphy of The Open University for comments and for proofing this chapter. Balakrishnan, G., & Cooetzee, D. (2013). Predicting student retention in Massive Open Online Courses using Markov models (Report No. UCB/EECS-2013-109). Berkley, CA: University of California at Berkeley. Retrieved from https://www2.eecs.berkley.edu/Pubs/TechRpts/2013/EECS-2013-109.pdf. Boyd, D., & Crawford, K. (2011, September 21). Six provocations for big data. SSRN. Paper presented at A Decade in Internet Time: Symposium on the Dynamics of the Internet and Society, Oxford Internet Institute, Oxford, UK. Retrieved from https://papers.ssrn.com/sol3/papers.cfm?abstract_id=1926431. Downes, S. (2012). Connectivism and connective knowledge: Essays on meaning and learning networks. Ottawa, Canada: National Research Council Canada. Retrieved from https://pdfs.semanticscholar.org/4718/ee3c1930820e094552f0933cbc3b86548dbc.pdf. ESMA. (2016, December 19). European Supervisory Authorities consult on big data. European Securities and Markets Authority. Retrieved from https://www.esma.europa.eu/press-news/esma-news/european-supervisory-authorities-consult-big-data. Koller, D., Ng, A., Do, C., & Chen, Z. (2013). Retention and intention in massive open online courses: In depth. EduCause Review Online, 48(3), 62–63. Retrieved from http://er.educause.edu/articles/2013/6/retention-and-intention-in-massive-open-online-courses-in-depth. Morozov, E. (2014, October 13). The planning machine. The New Yorker. Retrieved from www.newyorker.com/magazine/2014/10/13/planning-machine. Rayyan, S., Seaton, D., Belcher, J., Pritchard, D., & Chuang, I. (2013, October). Participation and performance in 8.02x Electricity and Magnetism: The first physics MOOC from MITx. Paper presented at Physics Education Research Conference Proceedings, Portland, Oregon, US. Retrieved from http://arxiv.org/abs/1310.3173. Sinha, T., Li, N., Jermann, P., & Dillenbourg, P. (2014, October 25). Capturing “attrition intensifying” structural traits from didactic interaction sequences of MOOC learners. Paper presented at the 2014 Conference on Empirical Methods in Natural Language Processing. Workshop on Modeling Large Scale Social Interaction in Massively Open Online Courses, Doha, Qatar (pp. 42–49). Taberg, Sweden: Taberg Media Group AB. Retrieved from https://www.aclweb.org/anthology/W/W14/W14-41.pdf. Skrypnyk, O., de Vries, P., & Hennis, T. (2015, May 18–20). 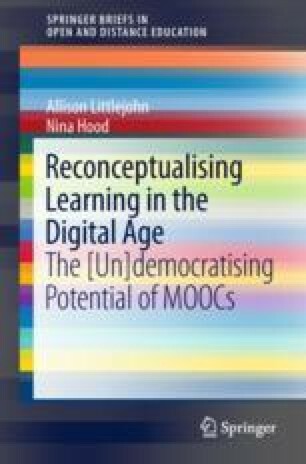 Reconsidering retention in MOOCs: The relevance of formal assessment and pedagogy. Paper presented at the Third European MOOCs Stakeholders Summit, Université catholique de Louvain, Mons, Belgium. Retrieved from https://s3.amazonaws.com/academia.edu.documents/37666738/Papers.pdf?AWSAccessKeyId=AKIAIWOWYYGZ2Y53UL3A&Expires=1503231269&Signature=IrKy647r03CIxal0L%2BVnXQFNlkQ%3D&response-content-disposition=inline%3B%20filename%3DDesign_intent_and_iteration_The_HumanMOO.pdf#page=166. Williamson, B. (2015, April 15–17). Cognitive computing and data analytics in the classroom. Paper presented at British Sociological Association Annual Conference 2015, Glasgow Caledonian University, Glasgow, UK. Retrieved from http://www.academia.edu/11968853/Cognitive_computing_and_data_analytics_in_the_classroom.